Salvatore Cincotta recently contracted Visual Lure to design a complete branding/identity package for one of his lucky on-screen viewers at Creative Live. Gray Photography, soon to be Jeff & Jewels Photography, was the lucky viewer who received the gift. Included was a new logo design, a stationary/identity package, and a custom WordPress website home page layout. Sal also requested that we show our design process along the way. Below you will see everything from initial logo design sketches to final home page design. After our initial consultation with the client, they decided that “vintage” and “modern” were what they wanted their image to portray. They wanted it to look high-end yet have a vintage charm, similar to their style of photography. 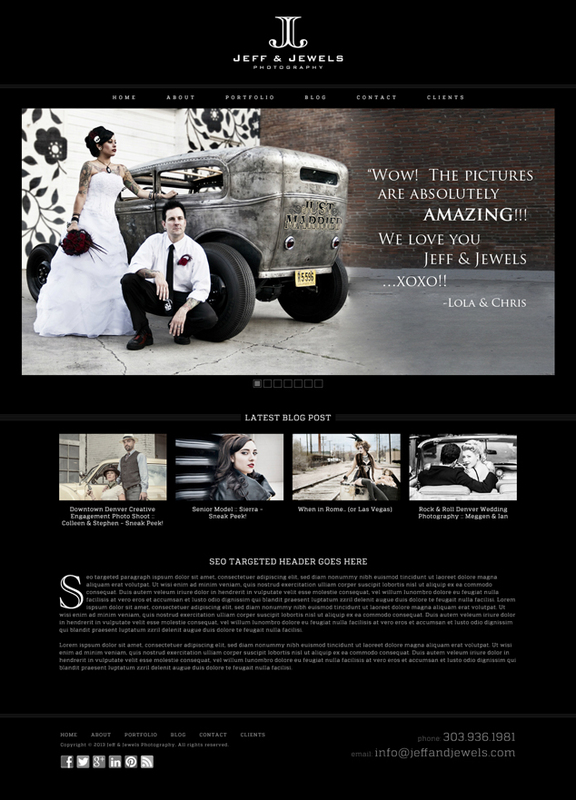 They also wanted to stick with a black and white color theme, which is always a great color pallet for photographers. It allows the photography itself to really stand out. The client loved all three and had a hard time deciding, but in the end, they selected the logo design at the bottom. Here is the final logo and stationary/identity package including fonts and patterns. Click here and like our facebook page to stay in touch and see all our latest work.